Peony wilt is a common fungal disease of peonies, producing brown patches on the leaves and stems, which then collapse, and flower buds fail to develop and open. Peony wilt, sometimes called peony or botrytis blight, is a common fungal disease of peonies – both herbaceous peonies and tree peonies – that produces brown patches on the leaves and stems. Badly affected leaves and stems may then collapse and die. Affected flower buds turn brown when small/pea sized, fail to develop, don’t open and die – resulting in no flowers. Infection may occur just below the flower bud, which then flops down. This is often referred to as peony bud blast disease. Peony wilt is more prominent during cool, humid or wet weather from spring to early summer. In wet conditions, a fuzzy grey mould appears on affected parts. What is peony wilt caused by? Peony wilt is caused by the fungus Botrytis paeoniae, which is closely related to Botrytis cinerea that causes grey mould on other plants. The sclerotia germinate in spring to release masses of airborne spores, which then spread to the leaves, stems and flower buds. More airborne spores are also produced by the fuzzy grey growth, spreading the disease even further. It is difficult to control peony wilt once it is established. So check plants regularly, especially during wet or damp weather. Removed affected leaves and destroy them as soon as symptoms are seen to help prevent the disease spreading. Especially clear away all affected parts that fall to the ground. And clear away all dead plant growth as and when it appears, and in autumn when plants die down. 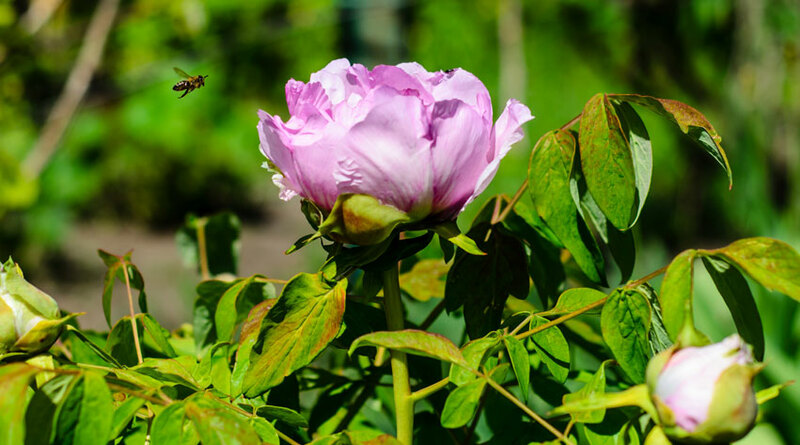 Unfortunately, there are no fungicides available for home gardeners to use to control peony wilt. Keep plants growing strongly – high potash feeds will help strengthen plant growth. When watering, keep water off the foliage – water the soil only.